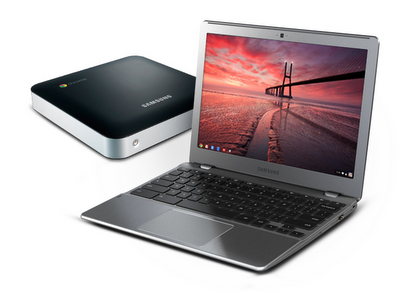 Google is showing off a shiny new Samsung Chromebook and the new Chromebox today, which come to the table not only with beefier specs but with an all-new user interface. For those who aren't familiar, ChromeOS is a new computer operating system from Google, one where everything runs inside a Chrome browser and from the cloud. It's a concept well-received by many, hated by just as many, but leaves most folks wondering why. The first consumer Chromebooks came out last year, and their anemic hardware and high price tag overshadowed their main selling points -- a Chromebook is the ultimate multi-user system, as all your data is stored in the cloud and accessible when you log in with your Google account. When you shut it down, nothing is saved locally and the devices is ready for the next user. As long as you have a constant connection to the Internet (and use Google's services) they are a perfect web-machine. A couple of us here at AC use them, and they come in handy when you don't want (or need) to log in to a "real" computer for a few minutes work. Today's news makes them a bit more attractive. The hardware has been revamped and now the system runs on an Intel dual-core Sandy Bridge Celeron processor with 4GB of RAM. This should offer up quite the performance boost, but we're curious how it affects the battery life. They look like something we want to try. Most importantly (and the reason why we're as curious as we are) is the new software. ChromeOS version 19 is now live and stable for the new gear, and with it comes an entirely new UI. Instead of just the single browser window ChromeOS offered in the past, you now have a home screen, a system tray and notification area, and shortcuts to commonly used apps in place. Yes, apps -- Google is placing a new focus on the Chrome appstore, and the wonders of webapps (hello there, Enyo team!). We've been using the beta version of v19 for a while now, and to us, things look and feel a lot like an Android tablet. I even find myself touching the screen to try and launch things like the GMail app. Could this be the first step to a true convergence of ChromeOS and Android? At one time Google told us that the two will never meet, but we've already seen Chrome Browser for Android, and many think a Chromium, open-sourced version will become the default browser. We expect to hear more about ChromeOS, and any potential future with Android at Google I/O in just a month.